Last year, the Patriot men’s basketball team finished with an overall record of 16-12 and a Peach Belt Conference record of 9-9. But a new season means fresh faces, including new assistant coach Sean Sweeney. Sweeney will step in to be part of the three-man coaching squad, which also includes fourth-year assistant coach Crayton Jones and seventh-year head coach Gary Edwards. Sweeney hails from Philadelphia. He graduated from Charleston Southern University in 2010 with a B.S. degree in criminal justice. While at CSU, Sweeney played two seasons on the Buccaneer basketball team. He attended CSU after transferring from Penn State Brandywine. After graduating, Sweeney served as the director of basketball operations at Charleston Southern for the 2010-11 season. At the same time, he worked as an athletic office assistant for the school. The next year, Sweeney served as an assistant coach at North Charleston High School. In Sweeney’s one season with the team, the Cougars would win the 2A state championship. To further his leadership credibility, Sweeney has also been employed as a camp clinician at Wake Forest University, University of Pennsylvania, University of South Carolina, Clemson University, Charleston Southern University and The Citadel. 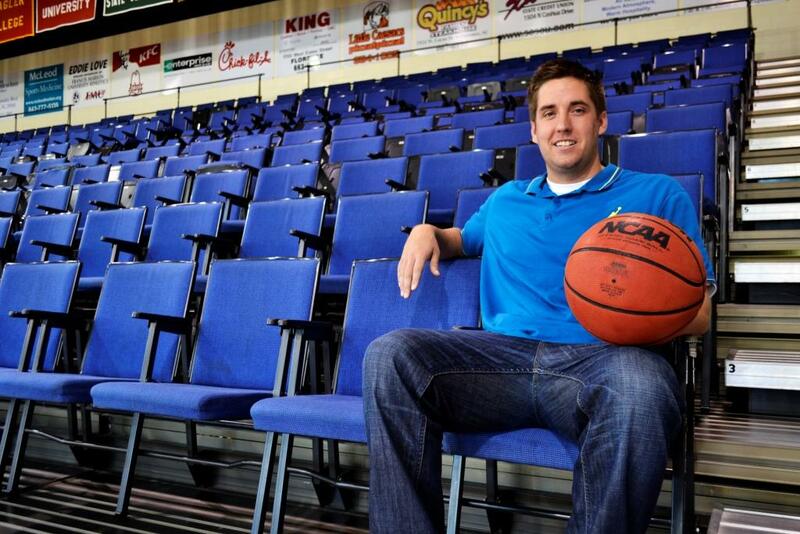 This will be Sweeney’s first season as part of the FMU coaching staff and he comes in with high expectations. Sweeney also said that the new additions to the basketball facilities are “amazing” and that he likes the weight room. Sweeney also seemed excited to be working with FMU head man Gary Edwards. Edwards actually coached at Sweeney’s alma mater Charleston Southern, where he won 121 games in nine seasons and remains the winningest coach in CSU history. “The opportunity to work for Coach Edwards, who is a proven winner in his career, is very exciting. I’m also excited to be at Francis Marion because it is a great academic and athletic school,” Sweeney said. Sweeney is also involved in FCA (Fellowship of Christian Athletes) and Athletes in Action. The 16-12 record the Patriots achieved last season was good for only eighth out of thirteen PBC teams. The 9-9 conference record was also good for only eighth. This is a position that Coach Sweeney is seeking to turn around. Make sure to watch for Sweeney and the Patriot basketball team as they kick off their season at home against Morris College on November 19. The team will play seven of its first ten games, including its first four games of the season, at home.